How does one surf through the chilly winter? You cope with it by being thankful you’re not surfing in Iceland! The down side of holidays is the mad dash that you have afterward, catching up on the stuff that happened while you were away, and preparing for the stuff that is to come! It has certainly been busy since I arrived. Friday saw a baptism in the morning & a wedding in the afternoon. 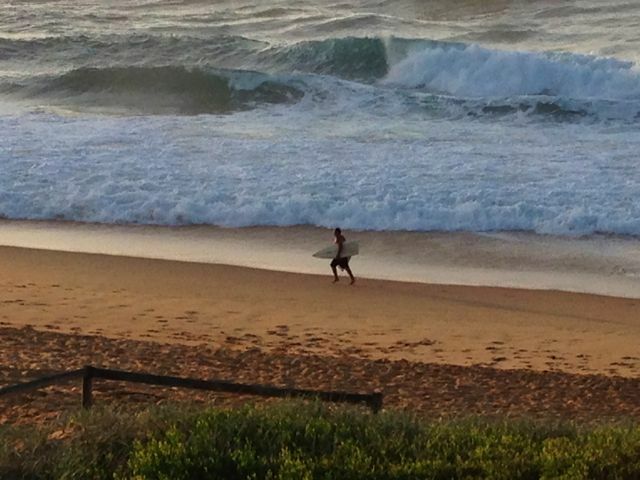 Saturday morning was going to be surf day. I got down to Avoca & it was BIG and messy. Colin & I drove around to Copacabana, and after watching the waves for 5 minutes, we decided we might sit the day out, enjoy a chat & have a coffee. While we were watching a guy on a big wave out the back, he got barrelled in a barrel so high he was still standing straight, but then the spray blew out, we saw the board flip & I can only imagine he got hammered. We sort of lost sight of the guy, then a couple of minutes later, we saw him jogging along the beach with his board snapped in half. Safe to say, at that point I was happy with my no-surf decision! Saturday was another baptism, some more desk work, then some family time in the afternoon! Now I’m on the downhill run. One morning service done, and just about to finish off some prep for this evening. But it’s Palm Sunday next week, and Easter Sunday after that…. so I guess I had better get used to feeling busy! I don’t often get to go back to Coonamble. I love the whole process of driving there. Push through vineyards & onto the Golden Highway. Cruise over the rolling, verdant hill country. Push through the sparse national forests around Mendooran. (and on this occasion make a detour into Dubbo, but we wont talk about that because it spoils the romance). Gilgandra is the turning point…. “Cooee Country.” The lands starts to flatten out, the grass moves from green, to brown, to a yellowy grey. Gulargambone. It’s a great name for a town & it means I’m almost there. Sometimes… driving into Coonamble, this time, driving to my Aunt & Uncle’s place, Willow Downs. I wont bang on about Maurny & Herbie, because I know they’ll read this, suffice to say, we had an awesome time staying with them, and it was a real highlight for the kids. There were lots of things that were fun about our visit. Getting to meet the dogs, feed the chooks, see the sheep & feed the cows….. al of which scared the heck out of Gumnut! My personal highlight, however, was waking up a little before dawn, looking out over the massive plain toward the Warrumbungles, and watching the sunrise. The pictures don’t capture the majesty! Friday morning we had to get the obligatory family picture (we don’t have enough of them) and one with our wonderful hosts! And then it was off to the Wedding. It’s lovely to play a part in your own cousin’t wedding, and once you get through the struggle of getting the local minister’s permission, the local bishop’s permission, your bishop’s permission & then your boss’s permission to take the time off, it’s also a lot of fun! Pumpkin & Gumnut got special clothes, and loved seeing special drinks & food. 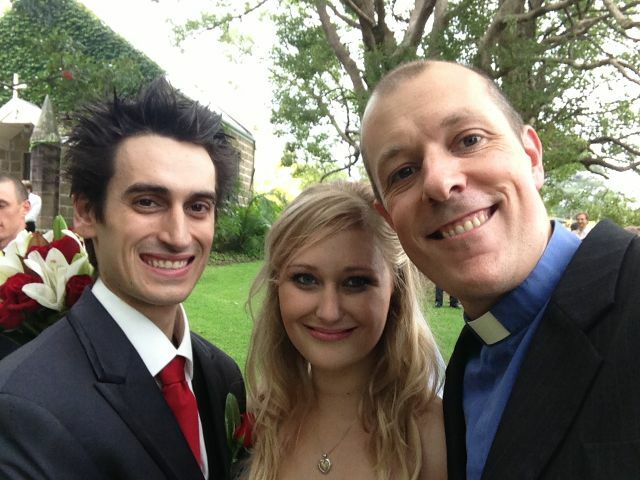 Needless to say, I got my obligatory self-take with the happy couple. And also some lovely family pics. That night we went & stayed at Urungie, Uncle Stevie’s place (Stevie is also a wonderful host. I need to be clear, lest Aunty Barb reads this, that he was ever-attentive, and thoughtful in his hosting!) and then it was a long drive off the plains, through the hills, and back for a brief overnight stay at my parent’s place in the Hunter. We’ve been looking at buying a new desktop computer. I’ve had our current one since Bible College & it’s starting to get a little slow, and more than a little senile. I almost bought one a month or two ago, but was thankful I held off when Mac announced that they are rolling out the latest edition of the iMac. Wow, what a bold move! Of course, the cynics will jump up & down, saying this is the way they force people into purchasing movies through iTunes instead of buying DVDs. Of course, I’m not so naive as to say that this isn’t a consideration for them, but I actually think this is a bold & wise move by the mac people for other reasons. DVDs, even bluerays are yesterday’s news. Disks are too big, it takes nothing to scratch them & leave them worthless, and solid-state memory is getting cheaper and cheaper by the day. Why would you want a DVD if you can get something on a thumb-sized drive? (apart from advertisers, who, no doubt, appreciate the extra real-estate to advertise their wares….) Why would you have a big device with lots of moveable (read:breakable) parts that take up a lot of room if they don’t really do the job? At some point in time the world needs to move on, and Mac is showing that they’re willing to do so. Darn right! I am thinking about whether I need to rip all my DVDs to a hard-drive so I can still watch stuff in my study… but before I do that, I have to work out whether I am officially breaching copyright law by doing so. Australians, who were one of the lowest per-capita purchasers of videos were apparently the worlds biggest per-capita purchasers of DVDs! Will all of these collections be redundant? It is something to consider. But I do think Mac is making the right move. As much as I treasure the memory of buying my very first CD (De La Soul’s “three feet high and rising” at Tower Records in San Fran), and my first ever DVD (Fritz Lang’s “Metropolis” in bought in Melbourne) the truth is, the world has moved on & computers ought to as well!